Two Spoons is the 10-month-old takeover of 72 Honor Oak Park, previously known as Hop Scotch. A cosy little café by day, we’re here for the night: a showcase of its new list of 10 cocktails inspired by local landmarks and figures. Inside, you could be in Paris with the darkened, intimate atmosphere - almost enough to make you forget that just outside are London’s rainy streets and not a mild, leafy Parisian boulevard. Almost. Except that the crowd inside is distinctly local - the vibe is open and warm, all candle-lit smiles and mingling, a uniform smattering of the evening’s first debutante cocktail - the 'One Tree Hill', garnished with orange twists and lively sprigs of lavender - sipped savouringly between sentences. The new menu is a definitively local affair with one important continental influence: Luca Cordiglieri, half of the duo behind the space’s reincarnation as Two Spoons and the genius behind its stunning list of cocktails. Absorbed in watching my next drink (The Karloff) be masterfully mixed at the bar, I hear a rumour that he was ‘once Bar manager at the Dorchester, but you’d never guess it’ - indeed you wouldn’t, Luca is humble and attentive, even in the midst of the crowded room he greets everyone as they arrive and takes time to make sure they are all enjoying themselves. And so we were. Back at my desk the next day with Luca’s beautifully illustrated new menu in front of me, I type his name into google and pretty soon see that the rumours were true… and then some. He has been appointed President of the UK bartenders guild, following an illustrious career that began with a bang when, at the age of 12, working in one of his father’s bars in the fashionable Italian fishing town of Santa Margherita Ligure near Genoa and Portofino, he lost the tip of his left index finger to an ice crusher. Things might have been a little less gory since, but Luca certainly hasn’t been afraid of hard graft, coming to London in 1992 and working his way up in some of London’s most renowned bars, including the Hyde Park Hotel (now the Mandarin Oriental), Harvey Nichols’ 5th Floor bar, The Hilton Waldorf and finally a 7 year stint as Manager of the esteemed China Tang at the Dorchester Hotel, during which time he was voted best Bar manager by Class Magazine. The sophistication and finesse of the 10 cocktail list is starting to make a little more sense. The tinkling of fork against glass rings out and the room hushes as Luca and business partner Rosy - who presides over the café side of Two Spoons and the evening selection of light bites - tell us the story behind the new menu. It has been meticulously researched, with days spent in the library and out on the streets visiting local landmarks and relatives of names of note that lived in the area. The end result is 10 signature cocktails reflecting 10 pieces of local history. The 'One Tree Hill' features a gin base with Italicus Bergamot Rosolio (a fruit liquor flavoured with bergamot - commonly referred to in Italy as ‘green gold’), elderflower tonic and camomile and lavender syrup. The herbacious notes reflect Luca’s background as something of a botanics buff and the result is refreshing and aromatic without being at all soapy or overpowering - delicious. Once the glasses are drained and all that remains is its intricate nest of orange peel we are served our second sampler of the evening: 'The Karloff'. The stage persona of William Henry Pratt, an actor born at 36 Forest Hill Road in 1887, Boris Karloff is most renowned for his role as The Monster in James Whales’ 1931 film Frankenstein, a role he reprised several times throughout his career, terrifying audiences for three generations. "He was inarticulate, helpless and tragic," Karloff later said of the monster. "I owe everything to him. He's my best friend." It was a friendship that proved prosperous, with Karloff going on to be inducted into the Hollywood Hall of Fame and win a grammy in 1967 for his voiceover role in Dr. Seuss: How the Grinch Stole Christmas. Similarly to Frankenstein’s creation, ‘The Karloff’ is a product of alchemy not only by Cordiglieri, but by local craft sake brewery Kanpai (situated in Peckham) whose innovative approach to the Japanese rice wine is designed for palates that enjoy craft ales and red wines, sake that can ‘stand up to a Sunday roast’. Backed entirely by crowdfunding, the microbrewers’ yields are now available in a range of shops, bars and restaurants across London, including Two Spoons. 'The Karloff' features Kanpai’s Cloudy Nigori Sake (with notes of fennel and banana), on top of gin and alongside grapefruit juice, tonic syrup and basil. The result is aromatic, dry and crisp, the kind of drink that makes you feel refined as you slowly sip, helped by its sophisticatedly simple presentation in a short coupé glass, a black-and-white passport photo of moody looking Karloff pinned to its rim. As part of their 10 week residency at Two Spoons (on til the weekend of the 13th of April) Taiwanese street food pop-up Tiger Bites served us canapé versions of their tasty fried chicken bao (with a seitan vegan friendly option) - pillowy buns loaded with a ridiculously generous filling of tender fried chicken in a light crispy batter. A portion of their dusted fries (sweet potato fries sprinkled with cinnamon sugar) in katsu sauce lasted mere moments on our table and the news that there is a ‘loaded’ version on their menu featuring chinese pickles, sriracha and coriander has me checking my calendar for when I can get back there. 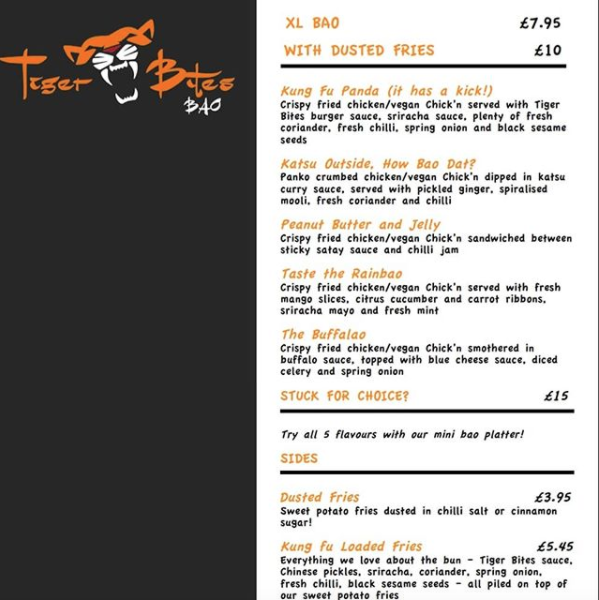 Other menu stand-outs are the ‘Peanut Butter and Jelly’ bao featuring their signature chicken with sticky satay sauce and chilli jam and ‘The Buffalao’ - fried chicken smothered in buffalo and topped with blue cheese dressing, diced celery and spring onion. You can grab a taste of the action on Friday and Saturday nights - head down on Saturday to enjoy alongside live music from 8:30. By day, Two Spoons assumes its identity as a bustling neighbourhood café, offering a brunch menu to be lazed over on weekends or a quick coffee after a walk in the morning. They work with local suppliers including The Butcher’s Block and Cooper’s Bakehouse to ensure that their food is of the very best quality. The hours pass shockingly quickly and I realise I’ve given myself over completely to the laid-back European vibe and nearly forgotten that I’ve got to be up for work the next day. Luca jokes enticingly that there’s plenty more where that came from, and that we’ll have to come back to try the full menu. I don’t need telling twice. I’ve already got my eye on the ‘21 Gun’, an homage to Croydon Canal’s grand opening in 1809: a twist on a whiskey sour featuring Bénédictine (a herbal liqueur developed, unusually, by a wine merchant and a pharmacist in 19th Century France), red wine and maraschino liqueur, as well as ‘A Good Tipple’ - named for Gloriana or Elizabeth I who, legend has it (after enjoying a good tipple herself) mistakenly knighted a tree on One Tree Hill, which henceforth became known as ‘Oak of Honour’ (you can see where we’re going here). This time around the tipple is chilli infused tequila with the Mexican smoked chilli liqueur Ancho Reyes, cucumber, elderflower and lime. It’s safe to say that in Two Spoons’ presence we’ve had a new honour bestowed on Honor Oak, one to be celebrated and shared in - let’s drink to that!